Why does this woman look so sad? She is about to eat something yummy! Before I even get into it, let me credit my original source for this recipe. Thank you NPR All Things Considered and Debbie Waugh of the Historic Green Spring House in Alexandria, VA! To see the original recipe and listen to the original story, click here! 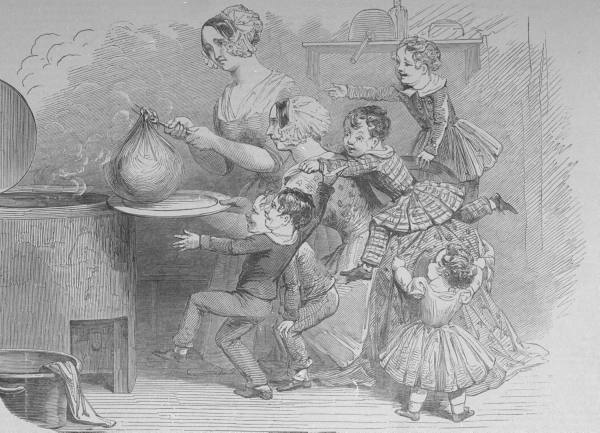 Christmas pudding is great because nothing that you've eaten in the past year will taste anything like it, it's a great spectacle for guests and it will make you feel like you're Martha Cratchit. Do I have time to be at home all day? Am I willing to give up one of my ceramic/pyrex mixing bowls for the month of December? Will said bowl fit in a larger pot so I can steam it? Do I want an intimate knowledge of suet? Do I have parchment paper in the house? Do I have something like twine? If you answered "no" to any of the above questions, you may want to reevaluate some things before you start. What is suet? Well, suet is beef fat from around the kidneys. It is a very hard fat and thus can withstand 6 hours in a steamer. No, you cannot substitute butter. I'm sure there are vegetarian pudding recipes out there, but if you want to go traditional Dickensian, go for the suet. Suet can be bought online. Be aware that it may take a few weeks to deliver since this product comes from England. Even if you see it on Amazon, observe the delivery times at checkout. You can also buy it ungrated at a butcher shop (call ahead). I purchase mine from Paulina Meat Market. They will give you a big old chunk that you need to grate yourself. Last year I laboriously shredded the suet with a grater. This year I remembered that I had a Cuisinart and did it that way. Beware that suet is tough on any grater, so proceed with caution an patience. *These are adjustments I made to the original recipe. 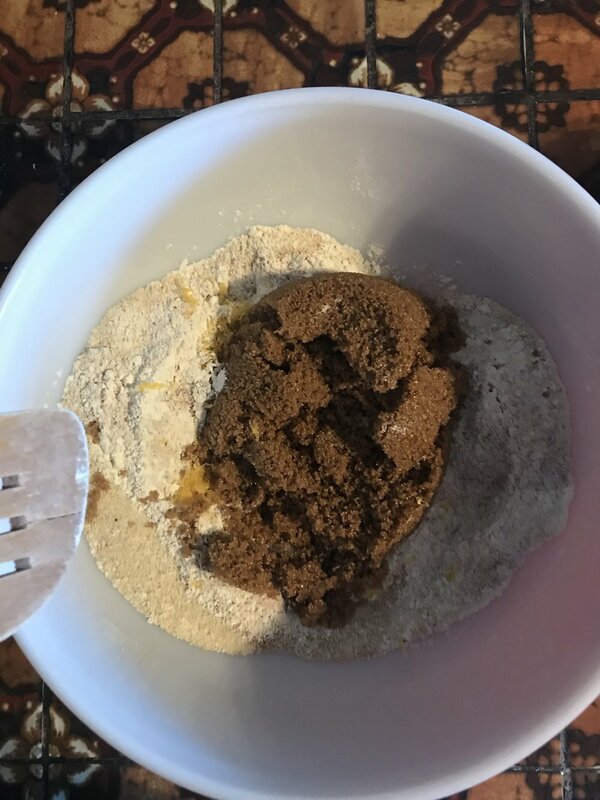 The extra egg and extra 1/4 cup of brandy help cover all the dry ingredients and I cut down on nutmeg because, by god, a little goes a long way. Use a LARGE mixing bowl, my biggest pyrex nesting bowl is great. And I use the next size down in the nesting bowls to put my pudding in. Add flour, bread crumbs, sugar, spices, lemon zest and salt. Get these ingredients good and mixed. Add suet and get it good and coated. Next, add in ALL your dried fruit. Your flour mixture should nicely coat it. Once that is set, add your brandy in and stir. This will help wet the dry ingredients so the eggs can be incorporated more easily. This will also be when your kitchen starts smelling like Victorian Christmas. Next add in your eggs. You should end up with a sticky mess. Next comes the pudding basin. NOTE: They sell metal ones online. Being that this recipe calls for aging it for 4 weeks, using metal makes me extremely nervous. You don't want your pudding to taste like pennies. I've also read that a lot of these molds rust. This is a lot of work for your pudding to taste like rust. You can buy an official ceramic pudding basin like one of these with a nice big lip to tie your string around. But I just use the second biggest pyrex nesting bowl. Butter your bowl. I take a tablespoon of butter and use my hands to spread it around. Then transfer your pudding to your pudding basin and pack it down with the back of a spatula. Get a sheet of parchment paper and make a fold down the middle. This paper goes over your pudding and tied down with twine. The fold allows the pudding to expand without ripping the paper. Having a larger lip on your bowl makes this easier. The pyrex bowls are not ideal, but they work. See pictures below! Now you're ready to steam. Put your bowl into a steamer. If you don't have a steamer, use a regular pot with something like a trivet at the bottom. Fill with about 2 inches of water. Since there are a lot of minerals in tap water, filter yours, or even buy distilled water since the mineral deposits will often bake on to the bowl. (This is not a huge deal, it comes off!) Steam the pudding for 5-6 hours and make sure to keep an eye on things because you may need to replenish the water. Nobody likes a burnt pot. When you've successfully sat drinking wine and listening to Christmas music for 6 hours, turn the burner off and wait for the pot to COMPLETELY COOL DOWN. This is important since you are going to have to reach in and pull that bowl out. Please don't burn yourself. Even if you are excited to peak at your pudding (it's actually not much to look at). You can also use oven mitts. 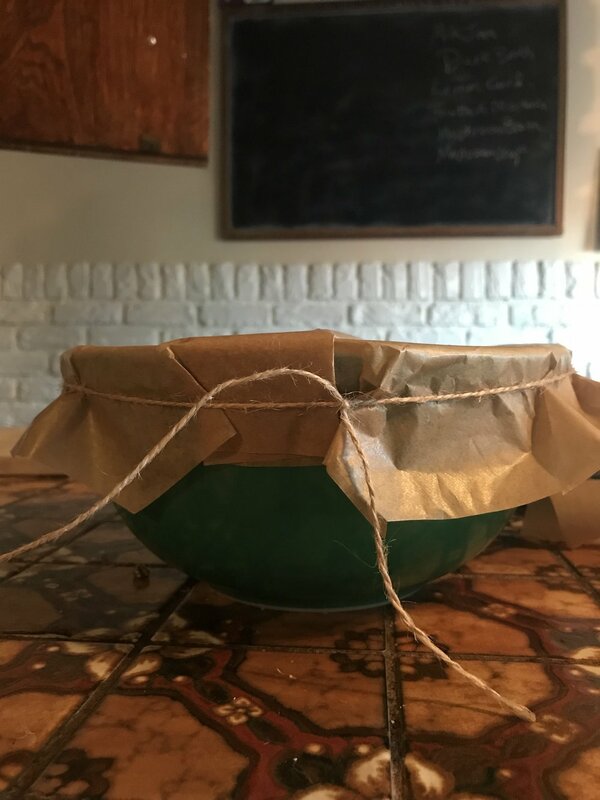 Once it's safe to get it out, replace the parchment paper and twine and put somewhere cool and dark until Christmas. Last year I literally just had this on my counter top. I have a new cat this year and I don't trust him, so I'm going to put it somewhere that I can close the door. To serve, re-steam for an hour. Use nice big old over mitts to get this out of the steamer. Turn onto a plate. It will be heavy and it should release from the bowl nicely. Now here's the fun part. You are now going to set the pudding ON FIRE to represent the passion of the Christ. Get a METAL ladle. Do NOT USE PLASTIC. Put about 1/2 cup of brandy in it and set on fire and pour flaming brandy over the pudding. You really need a visual for this so here it is. Please note that while using more than 1/2 cup of brandy might sound like fun, you don't want your pudding to be on fire for that long. It will get a little burnt on the outside. I like to serve this with a really dry champagne and some whipped cream while listening to "We Wish You A Merry Christmas". PS The most important part about this is the company. For one, it's Christmas, spread the love. Secondly, this pudding is deliciously rich and dense and despite what the original recipe says, I could have easily served 16 people a slice of this last and still had leftovers. Whoa guys...it's been a minute. Not because I haven't been busy (I made 103 pints of jalapeno jelly in ONE DAY fairly recently), but I often struggle with the ethics of what to put on here. Since I make jam for a shop, I'm not exactly going to put extra top secret recipes for all to see. However, I did come up with something original, not shop related, and completely my own. I call it...The Dolly Cocktail. My friend Peter called me over to teach him to make a simple jam. (Note, this is not secret but generally, folks, it's equal weight sugar and fruit, 2% of total weight of acid, and cook. Anyone can do it.) He had a bunch of sour cherries. You know, those gorgeous ones that look almost fake? We pitted them, jammed them, and said Damn. It seems like the window for sour cherries is small. Shortly after this Kyle and I traveled up to Northern Michigan where the sour cherries weren't ready yet. Back in northern IL, i got my hands on some "late in the season" ones. In true summer fashion, I stayed up late pitting cherries and staining my hands red. Making jam in the summer without AC is hot, even in the evening. My comrade Dylan was there to help and before long we were starting the boil. As with most of the French style jams I learned to make at the French Pastry School, the end result is more of solid fruit pieces in a light syrup that's extracted with the sugar and the application of heat. I ended up with over a pint of the sour cherry syrup. So when it came time to host a Dolly Parton bachelorette party for my dear friend Polly, it seemed only right to figure out how to use this magenta magic. Mix first three ingredients well. Pour into tumbler with ice and mix with equal parts La Croix apple cranberry seltzer or cherry lime seltzer. This seltzer is important because the above mix is sweet enough and should not be mixed with soda, but the La Croix gives it an extra pump of flavor. Top with black strap molasses bitters, garnish with sour cherry and citrus. Best enjoyed at Ravinia with friends while listening to Dolly's dulcet voice. Glass of last year's wine, blossoms for this year's wine, a bottle, and some polenta. Feed the people that help you make this. I first heard about dandelion wine through Ray Bradbury's remarkable book about being a boy in a small Illinois town during the summer of 1928. Dandelion Wine tells stories of happiness machines and bottles of air from places all around the world carted through the night by a strange peddler, so it was easy to imagine this enticing sounding drink as just another marvel spun from the brain of a science fiction writer. My grandmother, Deborah German, confirmed the very real existence of this beverage during a summer visit to my Grammy Snyder's farm in eastern Pennsylvania. My great grandmother was in the last few months of her life, her memory going, and my grandmother had moved into the old farm house to take care of her mom, Thelma Snyder, a lady who wore nylons even in the summer and cracked Japanese beetles in half with her thumbnail. I know now this must have been a hard time in my grandmother's life and that it must have been some kind of comfort to have her daughter and granddaughter sitting around the table with her. She proudly poured my mother and I a small glass of the golden wine she had made. I don't have many memories from this time of my life at the farm, but this is a vivid one. I could taste the alcohol of course, but the flavors of summer, of fields, of grass, of nectar overwhelmed any distaste I might have had for "grown up" drinks at the the time. It was years later before I made my own, and I'm not sure what exactly prompted the decision to bag and bottle the cheerful weed, but I know it came out of a conversation with Justin Warren about Ray Bradbury's book. We had been working on The Chicago Mammals's Dream Journal of Dr. Jekyll and had connected over a mutual love of the book somewhere between putting on age make up and tuning violins for the late night show. A few weeks after the show closed, we walked out to a field of dandelions, collected a hearty amount and sat around my kitchen table, splitting the buds open one by one in a method not unlike Grammy Snyder's beetle rampages. Our thumb nails turned black as the milk oxidized on our skin. 8 months later we uncorked our work in my living room as winter winds howled outside. It was exactly as Ray Bradbury described. Summer on the tongue, summer in a glass. It's a sentimental drink, of course. Incredibly labor intensive, you cannot do it alone. Two people might work all day for a yield of 5 bottles of wine. For this reason, you will never see it in a store, just as you will never find my Aunt Dorris's hickory nut cake anywhere but in her kitchen. There are some flavors that will never be cost effective to cultivate in everyday recipes. Making dandelion wine is fueled in part by the wonderful poetry of Bradbury's words, but mostly by the people who are eager to muddy their knees in a field, sit around a kitchen table brushing away a tiny ant here and there while they patiently and gently preserve summer. To honor the many hours of work over the years, I pour a sip from the previous year's batch into the new one so that each new bottle of wine has more parents than the one that came before. The collective labor of many hands grows with each season of wine, from Justin, to Kyle, to Polly, to Will and now to Jesse. As I type I can hear the bubbles rising through the airlock as this year's batch ferments. In a few weeks, I'll bottle it and put it in my parents' basement to stay cool while we forget it's there during the hot brief months of summer. Separate petals from the green casing. Simmer petals in water for 1 hour, do not boil. Cool and stream through cloth to remove petals. Add orange, lemon and sugar and boil hard for 20 min. Cool. Add yeast, stir well. More to fermentation vessel. When airlock stops bubbling, bottle. Wait a year before drinking. When 90% of your life is governed by the unknowns, the unquantifiable outcomes and the rejections that come hand in hand with a life in theatre, there is nothing more grounding than a pot of cooking strawberries. I mean it. I have been a professional preservationist (read, maker of jams, jellies, pickles, chutneys, marmalades and wines) for about 3 years. I work exclusively for Beans and Bagels, the Rockwell location, and I make all sorts of preserves for friends, family and myself. While Beans and Bagels does not sell whole jars of my products, it's always worth asking me if I have a stash at home. I usually do. Anyone can learn to preserve food. Humans have been doing it for thousands of years. I am always willing to teach and share information. I am largely self taught though I have also trained with Chef Sebastien at The French Pastry School in Chicago, IL. I am forever in debt to my friend and colleague, Adam Snow. I wouldn't be writing these words right now if he hadn't noticed me carrying a sack of late summer pears and gotten a swell idea.